Is water a commercial good like Coca-Cola, or a human right like air? 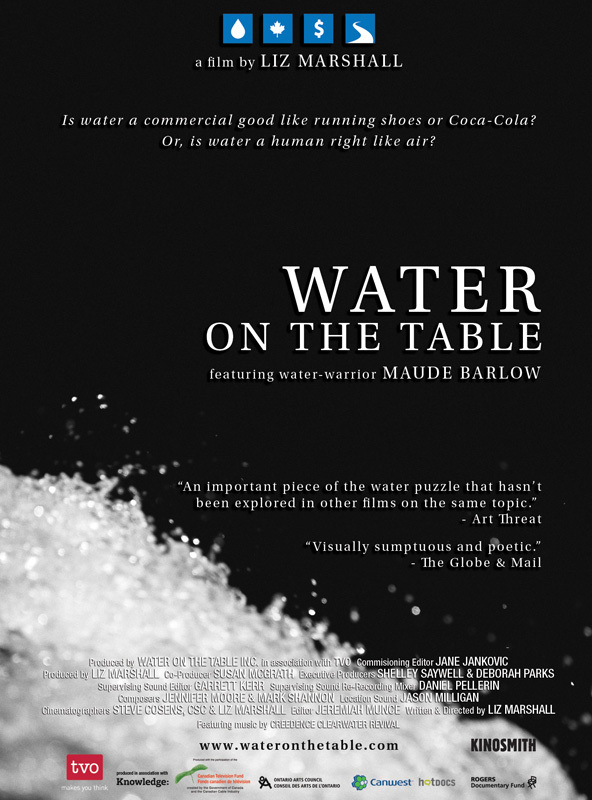 Featuring best-selling author, activist and public figure Maude Barlow and her crusade to have water declared a human right, protected from privatization, WATER ON THE TABLE explores Canada’s relationship to its freshwater, arguably its most precious natural resource. The film shadows Barlow over the course of a year as she leads an unrelenting schedule as the U.N. Senior Advisor on Water to Father Miguel d’Escoto Brockmann, President of the 63rd Session of the United Nations. Stream or Download from Vimeo. Fast forward to 2007, when I set forth (tenaciously) to raise funds for an epic film concept that would: a) intimately feature Maude’s crusade to have water declared a human right, b) explore Canada’s water from both a celebratory and political perspective, c) present strong opposing views from experts in Canada and the U.S.
Not an easy film to pitch or to fund – especially during a time when the film and television industry was experiencing a wave of ‘water fatigue’. I persisted and production was greenlit right at the time when Maude Barlow was appointed Senior Advisor on Water to the President of the U. N. General Assembly! This powerful storyline informs the film. With the help of a stellar team of filmmakers WATER ON THE TABLE was released in 2010. My hope is that it touches hearts and minds and significantly contributes to the growing movement to have water declared a human right. Commissioned by TVO for The View From Here. Produced with the participation of Knowledge Network, the Canada Media Fund, the Canwest Shaw Media Fund, Ontario Arts Council, and the Rogers Documentary Fund. Distribution: Kinosmith. BullFrog Films. McNabb and Connolly. Acquisition: Canada’s documentary channel.